UPDATE 10 P.M. MARCH 17: The officer involved in the shooting at the Bellagio has been identified as Officer Joaquin Escobar. Officer Escobar is 29-years-old and has been employed with the LVMPD since April 2017. Officer Escobar is assigned to Convention Area Command, Tourist Safety Division. He has been placed on routine paid administrative leave pending the outcome of a review of this incident. UPDATE 2 P.M. MARCH 16: The Las Vegas Metropolitan Police Department has confirmed that the suspect has died. The Clark County coroner will identify the deceased after relatives have been notified. No other information is available at this time. This is the 4th shooting so far this year involving a Las Veas police officer. Per LVMPD policy, the identify of the officers involved in the shooting will be released after 48 hours. UPDATE 1 A.M. MARCH 16: Police say that a Las Vegas police officer and a robbery suspect were both shot tonight during an incident at the Bellagio hotel-casino on the Las Vegas Strip. According to Capt. Nichole Splinter, a person with a gun approached a casino cage in the poker area around 9:45 p.m. The alleged thief then fled out the north doors of the casino and attempted to carjack someone who had just pulled into the hotel-casino. The suspect was unsuccessful and was confronted by four police officers. The suspect fired at the officers, hitting one of them in the chest area. Another officer returned fire, hitting the suspect. The police officer and suspect were transported to a local hospital. The officer, who was wearing a bullet proof vest, was treated and released. The suspect is in critical condition. The police department will hold another briefing in 72 hours. This isn’t the first time that someone has attempted to rob the Bellagio. One of the most famous heists happened in December 2010. Anthony Carleo, who called himself the “biker bandit,” robbed both the Bellagio and Suncoast casinos. Carleo took approximately $1.5 million in casino chips at gunpoint from a craps tables in the casino’s pit area. He then ran through the casino wearing a full-faced motorcycle helmet and escaped on a motorcycle. He was later sentenced to 9 years in prison. Sebastian Gonzalez told police that he helped burglarize a store inside of the Bellagio-casino in March 2017 because people in Mexico threatened to hurt his family. The group fo robbers wore masks during the robbery. Gonzalez wore a pig mask during the heist. A man wearing a hooded sweatshirt and a blonde wig and armed with a gun robbed the hotel-casino in the middle of the afternoon on Nov. 28, 2017. Actor James Wood was gambling at the casino at the time. The cage was also robbed in 2000 . During that incident, 2 men in body armor jumped over the cashier cage counter and stole about $160,000 in cash and chips. LAS VEGAS (KTNV) — Officers from the Las Vegas Metropolitan Police Department were involved in a shooting at the Bellagio hotel-casino Friday night. 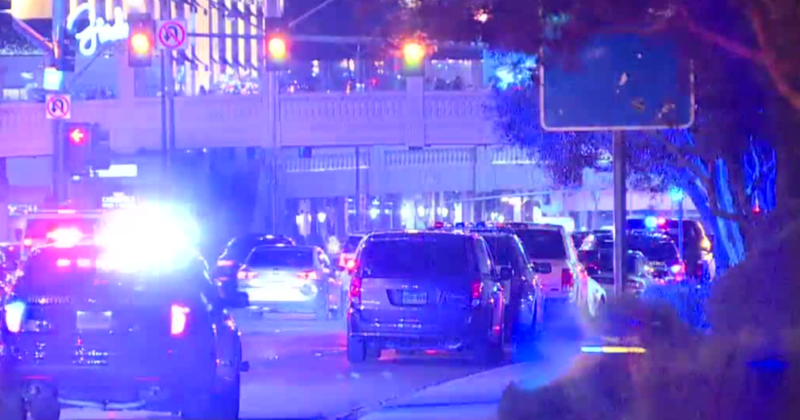 Authorities were called to the property located at the corner of Las Vegas Boulevard and Flamingo Road at around 10 p.m.
LVMPD said it was able to take a suspect into custody after a shooting took place at the hotel-casino. Further details were not released from the scene. Eastbound Flamingo Road between the interstate and Las Vegas Boulevard and southbound Las Vegas Boulevard between Flamingo Road and Bellagio Drive were closed to traffic immediately after the incident. A media briefing explaining the situation is scheduled to take place during the overnight hours, according to Vegas police. Stay with 13 Action News for updates on this developing story.